. The portal contains 89 online lessons on a wide range of digital subjects including web analytics, social media management and mobile marketing. Available in English and French and in the near future in Portuguese, we hope the portal will enable more people in more African countries to make the most of the web. The training is available to anyone, and people who complete the program will receive a Certificate of Online Proficiency. One of our trainees, Esalako Hillary from Nairobi, signed up for the digital skills program to learn how to use online tools to promote his new company Entrevene Africa - a social enterprise that encourages entrepreneurship amongst university students. After the training he realized that, in addition to promoting his company, he could also offer a digital marketing service as an additional offering to his clients. Four months later, and Esalako and his team have expanded their business and grown their revenues by over 60%. Helping people in Africa take advantage of the web is a task for everyone, and we’re very grateful to the many partners and collaborators that have given their support and played important roles in helping to get the program this far. We hope that through this and similar programs, Africans will begin to reap greater benefits from the internet. Here’s to the next 500,000 African digital entrepreneurs! Il y a six mois, lorsque nous avons annoncé notre engagement à former 1 million d'Africains aux techniques numériques en un an, nous savions que la tâche allait être rude. À travers toute l'Afrique, les habitants ont très envie de savoir comment mieux profiter d'Internet et des opportunités que cela offre ; mais les structures de formations aux techniques numériques sur le continent sont rares. Six mois plus tard, nous sommes fiers d'annoncer que nous avons atteint le milieu du gué. Plus de 500 000 Africains ont bénéficié d'une formation qui leur permettra de développer des affaires, de créer des emplois et de booster la croissance économique à travers le continent. Pour ceux qui n'ont pas la possibilité d'assister à des sessions de formation en présentiel et qui souhaitent acquérir des compétences numériques à leur rythme, à partir de leur propre téléphone ou ordinateur, nous lançons un nouveau portail en ligne Digital Skills Africa. Le portail comporte 89 cours en ligne couvrant de nombreux thèmes liés au numérique, tels que l'analyse web, la gestion des réseaux sociaux ou le marketing mobile. Disponible en anglais et en français et très bientôt en portugais, nous espérons que le portail permettra à davantage de personnes dans davantage de pays africains de continuer à tirer le meilleur parti d'Internet. La formation est accessible à tous, et ceux qui termineront le programme recevront un Certificat de compétence en ligne. Un de nos stagiaires, Esalako Hillary, de Nairobi, s'est inscrit au programme de formation aux techniques numériques dans le but d'apprendre à se servir des outils numériques pour promouvoir sa nouvelle entreprise, Entrevene Africa - une entreprise sociale qui encourage l'entrepreneuriat au sein des étudiants de l'université. Après la formation, il a pris conscience, qu'outre la promotion de son entreprise, il pouvait aussi proposer un service de marketing numérique, en tant qu'offre complémentaire à ses clients. Quatre mois plus tard, Esalako et son équipe ont développé leur entreprise et accru leur chiffre d'affaires de plus de 60 %. Vanessa Morris, une journaliste diplômée du Nigéria, n'avait jamais entendu parler du « marketing numérique » avant d'être invitée à l'un des cours de techniques numériques par un ami. Après la formation, elle a décidé de poursuivre plus avant dans le marketing numérique, et occupe désormais un poste de responsable des réseaux sociaux dans une grande entreprise de production au Nigéria. « Le plus intéressant dans tout cela, c'est que je gagne maintenant beaucoup plus d'argent en faisant un travail qui me passionne vraiment » a confié Vanessa. Aider davantage de gens en Afrique à profiter pleinement des atouts d'Internet est une tâche qui appartient à tout le monde, et nous sommes très reconnaissants à nos nombreux partenaires et collaborateurs qui nous ont apporté leur soutien et ont joué un rôle important pour développer le programme à ce niveau. Nous espérons que, à travers ce programme et d'autres similaires, les Africains vont enfin récolter tous les fruits d'Internet. En route pour les prochains 500 000 entrepreneurs numériques africains ! 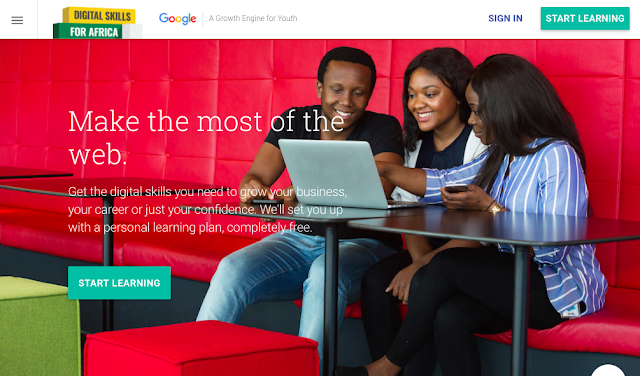 Six months ago, when we announced our commitment to train 1 million Africans on digital skills within a year, we knew it was going to be a tough task. People across Africa are thirsty to explore how to take better advantage of the internet and the opportunities it offers; but frameworks that provide digital skills training on the continent are few and far between. Fast forward 6 months, and we’re proud to update that we’ve reached the halfway mark. Over 500,000 Africans have received training that will enable them to build businesses, create jobs and boost economic growth across the continent. For people who are unable to attend face-to-face training sessions and who want to acquire digital skills in their own time from their own phone or computer, we’re launching a new Digital Skills Africa online portal. The portal contains 89 online lessons on a wide range of digital subjects including web analytics, social media management and mobile marketing. Available in English and French and in the near future in Portuguese, we hope the portal will enable more people in more African countries to make the most of the web. The training is available to anyone, and people who complete the program will receive a Certificate of Online Proficiency. Your 4-year-old may already be a swiping expert, but the app’s design makes it even easier for little fingers to navigate with larger images and bold icons. And we’ve built in voice search so that even if your child can’t spell or type, they can still find videos of things they’re curious about. We’ve built the YouTube Kids app to be a more family-friendly experience than YouTube, a place for kids to explore their imagination and curiosity. You can browse channels and playlists in four categories: Shows, Music, Learning and Explore. Your favorite shows like LittleBabyBum, The ChuChuTV, Sockeye Media and Peppa Pig are in YouTube Kids. You’ll also find popular content from beloved African creators too. We’ve built options into the app that help you control the experience for your kids and put parents in the driving seat. Learn how the app works: When parents open YouTube Kids, they learn upfront how our systems choose and recommend content and how to flag videos. We always try to make the videos available in the app family-friendly, but no system is perfect. So if you ever find a video you’re concerned about, please flag it. 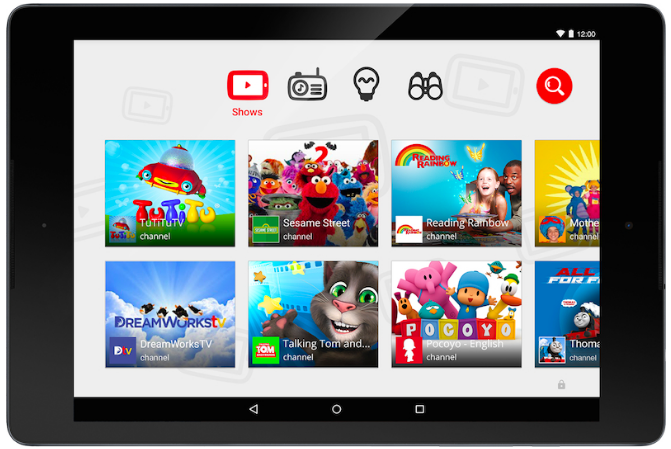 This helps make YouTube Kids better for everyone. Search settings: We’ll also prompt you to make a choice about how broadly you want your child to explore - turn search on to access millions of family-friendly videos, or turn search off to restrict your child’s experience to a more limited set. Either way, parents decide the right experience for their family from the get-go. Sound settings: Sometimes you need a little peace and quiet! You have an option to turn off background music and sound effects, so your kids can keep watching while you catch a breath. Customize your passcode: We’ve also heard some parents prefer a personal passcode, rather than a spelled-out code, so we’ve added this option to access parental controls. Logged out experience: The app is currently a signed-out experience with no ties to an account. We’ve also removed all features that are linked to an account like uploading, sharing, liking, etc. We’re excited to bring YouTube Kids to parts of Africa, and look forward to your ideas too so that we can better help your family explore, learn and sing along. From our family to yours, happy exploring! Teju Ajani, proud Aunt and YouTube Content Partnerships lead, SSA, recently watched Peppa Pig's Bubbles episode with her 6 & 2 year old nieces, along with countless videos on how to do the splits.